Have you ever been in an earthquake? Earthquakes shake our most basic assumptions: that the ground will remain steady beneath our feet, that the world's current existence is the way it will always be. But when tectonic plates shift under the earth's surface and the ground shakes beneath our feet, it rattles the bedrock assumptions on which we build our lives. The Gospel of Matthew reports that on the first Easter morning, an earthquake rocked the earth, ripped open the tomb, and scared the Roman guards at the tomb, who "shook with fear and became like dead men" (Matthew 28:4). This is the second earthquake reported by Matthew. The first one took place on Good Friday, when the noonday sky turned black and Jesus died. 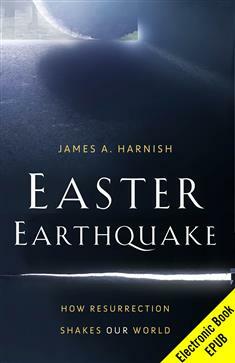 In Easter Earthquake, James Harnish invites us to place the resurrection at the center of our Lenten journey. This 6-week study explores how Christ's resurrection shakes some of our most basic assumptions about ourselves and God. "The earth-shaking promise of Easter is that God has not forsaken any of us," Harnish writes. "The risen Christ will meet us along the confused, chaotic, fearful paths of our lives and speak the same words the women hear at the tomb: 'Do not be afraid .'" This book reverses the usual focus of Lenten studies by starting at the empty tomb and seeing the entire journey in light of the resurrection. Join James Harnish in this energizing exploration that will inspire you to live as a more faithful disciple of Jesus Christ.